Yes, one might. It's a Bare, probably less than 200 dives, maybe only 100. Fit is everything, well after not being a leaky piece of junk. You are welcome to check it out. If it fits you can take it for a test dive. Minimally you'll have more information going forward. I live in the north end, about 3 miles NE of the U of W.
Oh great! Im 5'9" and 145 pounds. Would I fit any of the dry suits? I have 3 suits I got from friends that quit diving to sell. All in fine shape, zippers good, seals in 2 are all brand new, all different sizes. So.....what size are you? The big/main name I see are Bare, DUI, USIA, aqualung, Apollo. I've had good luck finding suits for friends on Craigslist in the $200-$300 range and I think that's pretty solid deal. But most importantly I think is how the suit fits you personally. Just my 2 psi, I'm sure you'll head 100 answers from 100 different people. 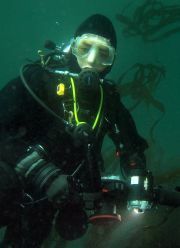 I'm looking to buy a used drysuit because I'm on a budget but I'm not sure where to start. I've been on ebay and craiglist but I'm not sure what brands I should be looking for and what prices are good deals. so if theres any advice anyone could give that would be much appreciated!